Harvard Business School Press, 9781422162293, 288pp. Confronted by omnipresent threats of job loss and change, even the brightest among us are anxious. In response, we're hunkering down, blocking ourselves from new challenges. This response hurts us and our organizations, but we fear making ourselves even more vulnerable by committing mistakes while learning something new. In Flying Without a Net, Thomas DeLong explains how to draw strength from vulnerability. First, understand the forces that escalate anxiety in high achievers and the unproductive behaviors you turn to for relief. Then adopt practices that give you the courage to "do the right things poorly" before "doing the right things well." 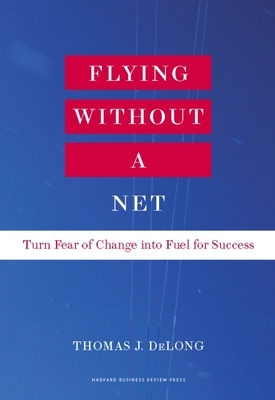 Packed with practical advice and inspiring stories, Flying Without a Net is an invaluable resource for all leaders seeking to thrive in this Age of Anxiety. Thomas DeLong is the Philip J. Stomberg Professor of Management Practice in the Organizational Behavior area at the Harvard Business School. His research focuses on the challenges facing individuals and organizations in the process of change.